We saw it. We loved it. The Garden in a Bag concept is so unique, we just had to have it here at Lavish & Lime. Now you don't just have to take our word for it. Canada's national online newsletter for Moms SavvyMom.ca gave it a thumbs up as a great teachers' gift this week. They call it a "gift that represents growth, life and beauty with the simple act of planting seeds." And it's true. 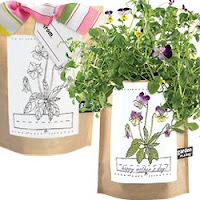 Everything you need to grow a lovely flowering plant or herb comes in the bag. Then you grow the plant in the bag. Ideal for brightening up any sunny windowsill, these plants can be grown indoors year-around. The seeds are organic, the coconut drainage husks are organic and the packaging is minimal to keep it eco-friendly. These bags are made in the US. SavvyMom particularly liked the idea of kids personalizing their gift by colouring the picture on the bag and writing their name or a message. Choose from pretty purple and yellow violas or organic sunflowers. This is a great option for teacher gifts, but don't stop there, we've found grandparents love these bags too. Read the SavvyMom review here. Browse our complete collection of Gardens in a Bag here. We have a great selection of flowers - from French Marigolds to Purple Petunias - and herbs including Oregano and Mint. Plus, don't miss our lovely Apple Tree - the perfect gift to mark a wedding or birth of a baby.